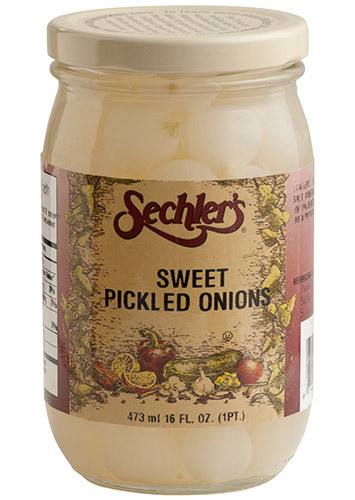 16 ounce Pearl Onions sweetened with pure sugar. and 1/10 of 1% Benzoate of Soda added as a Preservative. From MARK LEDBETTER of NEW CASTLE, Indiana on 8/23/2018 . GREAT WITH PEAS OR SALADS ! From Iris Getrost of Dayton, Ohio on 7/14/2017 . I found the Sweet Onions when I was on vacation in Indiana. They were the best that I had every had. From Anonymous of Harrisono, Ohio on 7/21/2016 . From Anonymous of Ridgewood, New Jersey on 12/31/2015 . These tiny onions have just the right bite, sweetness and tart. Perfect in a relish tray or a martini, Wish I could find them locally, but even with shipping, they're great value. From Judy Hamer of La Jolla, California on 6/25/2015 . The best ever...very crisp, crunchy and tasty.